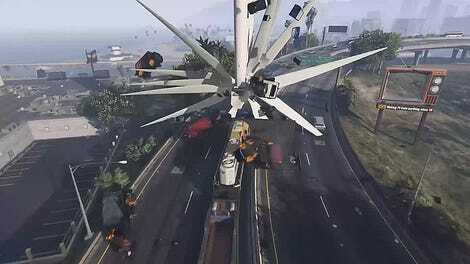 Rockstar recently added 20 stunt races to GTA Online, and they are bonkers. 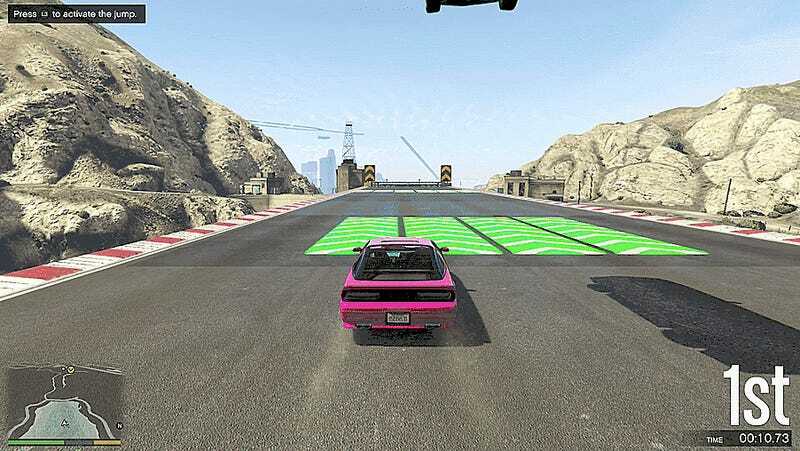 It helps that the new races focus on the most absurd vehicles, and together, these new tracks and stunt cars allow GTA Online to push the boundaries of what the player can experience. 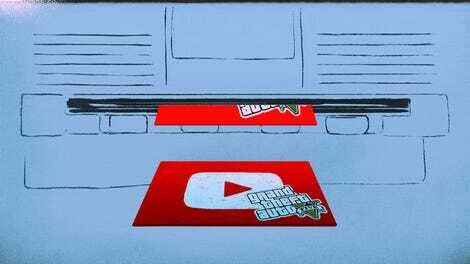 Rockstar primarily made use of three vehicles that the GTA community is fond of: the Rocket Voltic, the Ruiner 2000 and the Blazer Aqua. 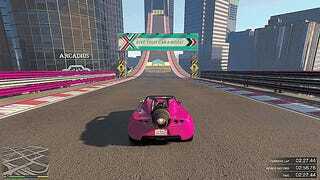 My favorite races involved The Ruiner 2000, as you must use the parachute muscle car to bunny hop around the track. Tracks are dotted with barriers that the player has to jump over, along with long gaps and shortcuts that can only be survived with expert usage of the parachute. The Ruiner 2000 stunt tracks are a blast, especially with a large group of racers. Almost immediately after a race begins, people start hopping over other drivers or using their parachute to glide over sharp turns. These new races feel more hectic and exciting due to all the different ways you can use the Ruiner to win the race or knock your opponents off the track. But sadly, missiles have been removed during races. The Rocket Voltic’s jet engine can be used to gain a quick speed boost, and the races are all about managing when to boost. If you use the rocket engine while turning, you can gain an advantage over players taking it more slowly, but you also risk crashing into a wall or flying off the track. If you time the boost just right, you can use it once in the air, allowing some players to fly down tunnels or across large sections of straightaways. 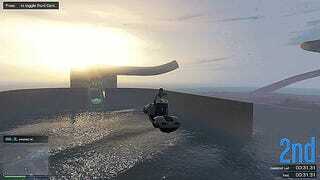 The final series of new stunt races focus on the Blazer Aqua, a four-wheeler that can turn into a jet ski. Unfortunately these races aren’t as fun due to a lack of speed. The Blazer Aqua is a cool vehicle, but slowly going around turns or crawling up inclines isn’t very exciting, especially when the Blazer doesn’t handle very well. Turns and jumps can be frustrating when you’ve got a large group of people racing together. That said, even the Blazer Aqua can have its cool moments too: at one point, I dove deep under water after a big jump and flew out like a dolphin. Nice. That said, you can easily skip The Blazer Aqua to focus on the Ruiner and Rocket Car races. Whatever new races you do decide to try, you’ll get a nice bonus: Rockstar is offering double XP and GTA$ for all special vehicle stunt races until March 22nd. Here’s a handy compilation of all the new races added with this latest update: The Blazer Aqua races, The Ruiner 2000 races and The Rocket Voltic races. The GP1 seems to be inspired by the McLaren F1 and it costs $1.26 million. While it’s not the most expensive supercar added to the game, but it certainly ain’t cheap. 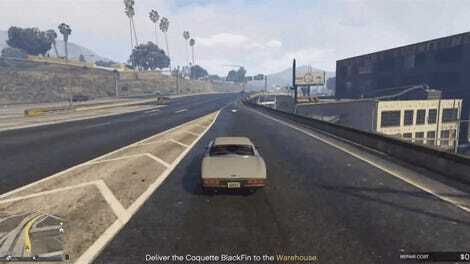 Players can now buy heist vehicles without unlocking them first. Before, you had to beat specific heists to unlock access to certain vehicles, like the HVY Insurgent. Now anyone with the cash can get these vehicles.